From Toka Loka Games comes Goo Saga, a platforming game about a tiny piece of goo, as the name betrays. Now, as is the case with games of the genre, most people look for very specific things in their platformers. Goo Saga has the tools to fill some platformer niches quite well, so read on to find out more about it. In Goo Saga, we learn about a reclusive scientist, living in the bottom of the sea, forgotten by his peers and the rest of the world. His one goal is to create life. After many attempts, he manages to create a tiny piece of elastic matter which he calls Goo. Some time afterwards, the scientist disappears. Seeking to find its master, Goo breaks its cage and strikes out to find the scientist. 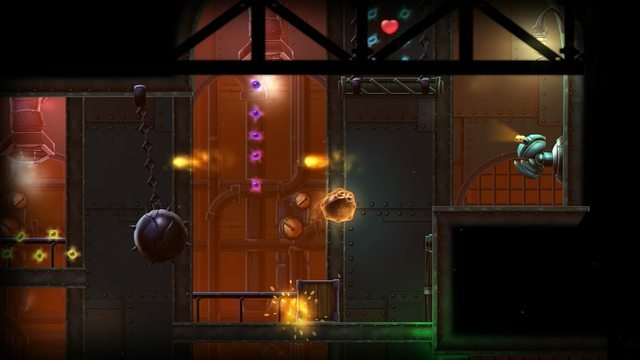 In terms of gameplay, the game is a standard 2D platformer. The one major difference it has is the way Goo Saga handles space. Seeing as Goo is made of elastic matter, it can both shrink and grow. The obvious use for this perk is going into smaller spaces, something the game will ask you to do quite often. The less obvious one is the way Goo handles in each state. When shrunk down, Goo is not as heavy, which in physics terms means it can start and stop faster. On the other hand, when Goo is in its grown state, it can gather up a lot of momentum, making it harder to stop moving but also more energetic when jumping up. When it comes to difficulty, the game certainly falls into the casual category. Every level apart from the tutorial has three different ways you can play it. The first is the normal mode, where you have to collect more than 80% of the orbs on the map to be able to progress. Orbs are not only spread around the map, but can also be gotten by killing enemies or through containers. All in all, there are actually more orbs than the game will tell you exist at the start of a level. This makes it quite easy to get above 80%. Once you beat a level on normal mode, you unlock the survival mode and the time trials mode. In survival mode, the level gets a bit harder while checkpoints cease to exist. This makes the stage tougher, but not in an insurmountable way. Chances are you will still not die while attempting it. Time trials follows the well-known format where you have to beat the level within a certain time. It does offer a challenge, but again, nothing too hard. On the art and sound department, the game is certainly pretty. The artstyle is cartoony and colourful, with elements of the background actually being animated. This makes the game feel alive and rewards the player who pays attention, which I like a lot. The game’s music is not amazing by any stretch of the imagination, but it is perfectly adequate for it. I especially liked the little sounds that play when Goo splashes around. By now, it should be evident in the review that Goo Saga is not a hard game at all. In fact, you can probably beat it in a few hours without really breaking a sweat. To some, this is a deal breaker, but remember what I said about the game filling some platformer niches? Well, the niche it fills is certainly the relaxing one. Most platformers have a “Threat”. This can be something chasing you, a timer, or a particulalry hard jump. Some of those things are present in Goo Saga, but are much more sparse than usual. This means that the game can be played just to spend some time lazily, enjoying yourself without stressing. Goo Saga might not be a tough game, but it still is a fun one. So there you have it. Goo Saga is a platformer that doesn’t really bring anything new to the table, yet it manages to elevate itself on its casual gaming premise. It is still a very enjoyable game that you can spend some hours one (or more if you are a completionist) and its price certainly adds to the allure. You can find Goo Saga on Steam for 5 euro. 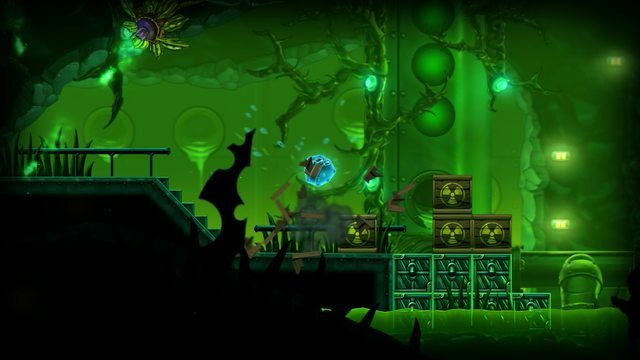 Goo Saga does not add anything new to the platformer genre. What it does add, however, is a polished, fun game with neat artstyle. It is built in such a way that it will be enjoyable all the way through, allowing you to sit back and relax for a few hours. – Doesn’t really add anything new.